E's seven-year-old cousin "J" came to spend a day. 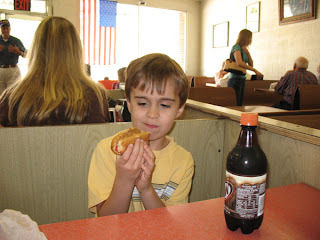 The first stop was a famous local hot-dog restaurant. More photos from J's trip will be in a later post. 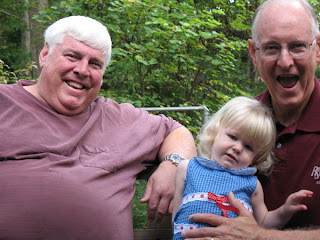 E and I also got the chance to visit with these two happy guys - Grandpa and his brother (one of our loyal blog readers, I might add). On Sunday E and I went to church where she called out "hi" to everyone she saw. She asked one lady to hold her hand and me to hold the other. 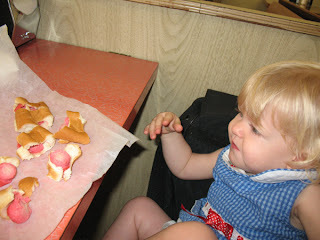 This lady was convenient at a place where E thought it would be fun to hold two hands like she does with Daddy and me. I left E in the nursery where she was the only child, but even though she's not two yet I think she's outgrowing it. There's another childcare room for 2 - 3 year olds which we'll try next time. When I came to pick her up she was sitting on the floor practicing fastening the straps on the baby swing. The nursery volunteer said they had been there 10 minutes, with E fastening and saying "hep" to get it unfastened. The other day she spent more time than that practicing a zipper ("ip"). Fasteners have always fascinated her.